The Merrykhana parade, 1927. Now known as the Starlight Parade, this parade is historically less formal than the Grand Floral Parade. City of Portland (OR) Archives, A2000-026.77. While trying to determine the origin of the name “Merrykhana” I saw numerous references to the comedic (and sometimes even bawdy) nature of the parade. Does anyone know where the name came from? the guys got a six shooter, nothing like packing at a parade. I did a little research and hope what I found is true. 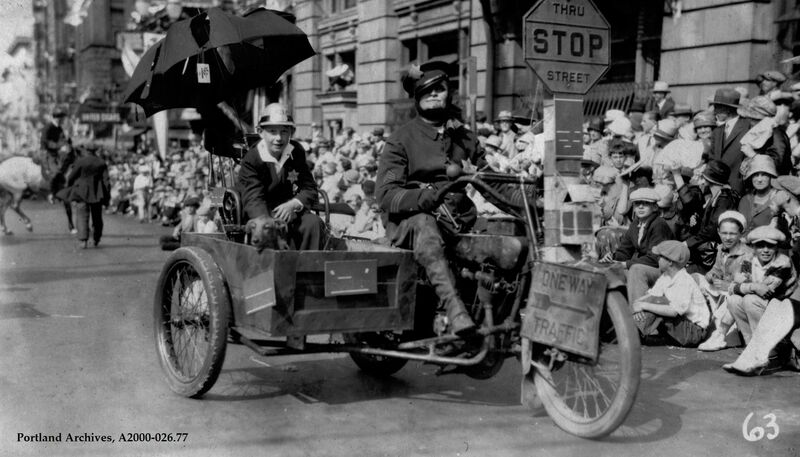 The first Merrtknana parade was in 1925. Parade participants would squirt water at the bystanders. Later, bystanders started sqirting water in return. Things escalated and by 1972 things got out of hand. In addition to clean water balloons, gutter water balloons and frozen water balloons were lobbed. Reports were recorded about drunken brawls. The parade was cancelled after 1972 and was replaced by the Starlight Parade in 1976. Looks to be an old 1858 Remington cap & ball revolver. I remember when the Merrykhana Parade was revived in the ’60s. Initially, Mom wouldn’t let us go because she said it had a bad reputation back in the earlier days. When we did go it was like a combination of a fun fair and Mardi Gras. Crazy, but fun! Thanks Susan for sharing the link to oregonlive and those neat old photos of beauty queens sitting in the laps of businessmen. My, we’ve come a long way! I remember being “scooped” up by a clown at age 6, as his was running with me under his arm down the parade route people from the crowd started to squirt him with water! (To my relief he returned me to my family) Does anyone remember the “Rainmakers” who carried umbrellas that were turned upward? Talk about the good old days…. I miss some (not all) of the Merrykhana wackiness. The Starlight Parade has gotten too corporate in my humble opinion.